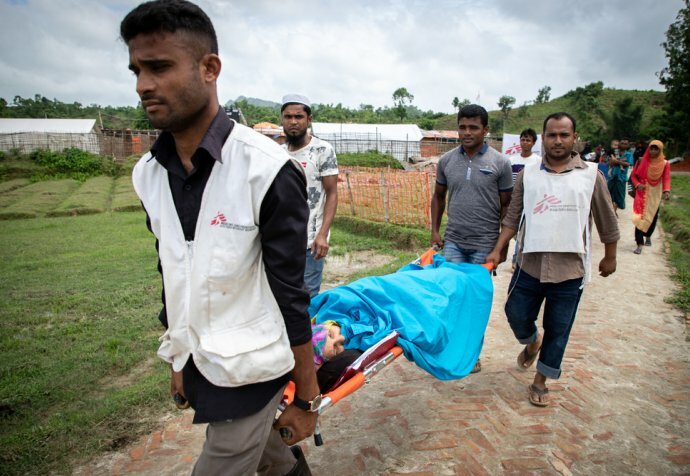 Prodjut Roy, 29, is a mental health supervisor with MSF and has been working as part of Nayapara Primary Health Centre (PHC) team in Teknaf, Bangladesh, since June 2018. During that time, he has seen the stigma associated with mental health services in the Rohingya community, but he has also seen patients find peace through the services of “shanti khana”. “Sometimes they come secretly. They do not want to share that they have some problems. They know their information will be kept confidential but when we ask if they know of other people who have similar problems, they don’t want to discuss the issue. They’re keeping the problem within the family members and they’re not going to expose the problem to others,” said Roy. Roy witnessed the impact of stigma first-hand on a visit to the nearby Unchiprang Primary Health Centre. When a patient registers at an MSF health centre, he or she receives an out-patient card indicating the kind of medical assistance sought. In this case, the card indicated that the patient was visiting the health centre for mental health services. The crowd-controller, who facilitates patient flow, invited her to come through to the mental health counselling room. Roy notices that this made the patient was extremely upset. “The patient explained that in their community ‘mental’ means insane, ‘mental’ means crazy, ‘mental means mad’. I shared this experience with the team and from that day I asked them please don’t use the word ‘mental’ in the facility or the community,” said Roy. Health promotion and psychology education activities carried out by volunteers in the community have started to ease the stigma around mental health. The Nayapara PHC has seen the number of patients seeking mental health services almost double in the last few months. Patients present with a mix of problems. The violence they experienced and witnessed has left it’s mark. Many suffer from post-traumatic stress disorder or acute depression. This is compounded by their current situation, the daily difficulties of living in a refugee camp, and uncertainty about their future. Roy tells the story of one particularly difficult case of a young women who was suicidal. Unfortunately, she was in the early stages of pregnancy so was not able to take the medication that may normally have helped her. Roy worked with her, with another specialist, over several months to provide support and slowly saw her improve. Eventually, once it was safe to do so, the MSF psychiatrist was also able to prescribe psychiatric medication. “Every day we see the same patients. They’re coming for follow-up. They’re coming for problem. And one day they’re getting better. That day is very special for us, as mental health practitioners,” said Roy.